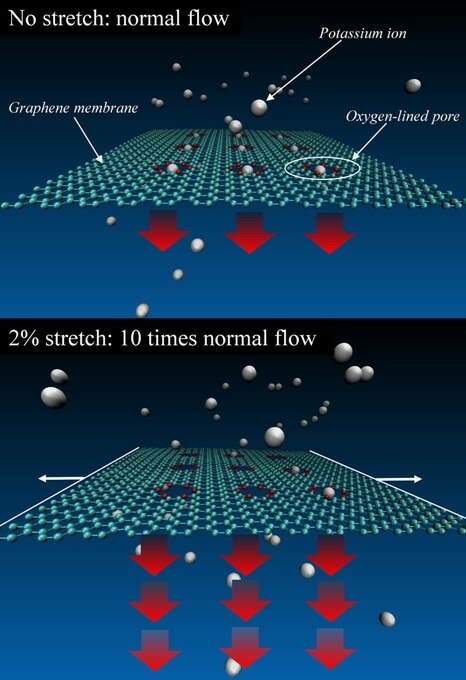 Scientists at the National Institute of Standards and Technology (NIST) have conducted simulations advocating that graphene, along with its many other beneficial properties, can be altered with special pores to serve as a tunable strainer or filter for ions (charged atoms) in a liquid. The concept, which may also function with other membrane materials, could have applications such as drug delivery, nanoscale mechanical sensors, water purification and pumps or sieves for ion mixtures similar to biological ion channels, which are vital to the functioning of living cells. The study is detailed in the November 26th issue of Nature Materials. Imagine something like a fine-mesh kitchen strainer with sugar flowing through it. You stretch that strainer in such a way that every hole in the mesh becomes 1-2 percent larger. You’d expect that the flow through that mesh will be increased by roughly the same amount. Well, here it actually increases 1,000 percent. I think that’s pretty cool, with tons of applications. Alex Smolyanitsky, Project Leader, National Institute of Standards and Technology. If it can be accomplished experimentally, this graphene sieve would become the first artificial ion channel delivering an exponential increase in ion flow when stretched, providing possibilities for rapid ion separations or pumps or precise salinity control. Collaborators are planning lab studies of these systems, Smolyanitsky said. Graphene is a layer of carbon atoms organized in hexagons, resembling in shape a chicken wire that conducts electricity. The NIST molecular dynamics simulations concentrated on a graphene sheet 5.5 by 6.4 nm in size and containing small holes lined with oxygen atoms. These pores are crown ethers—electrically neutral circular molecules said to capture metal ions. An earlier NIST simulation research revealed this type of graphene membrane could be used for nanofluidic computing. In the simulations, the graphene was suspended in water that had potassium chloride, a salt that splits into potassium and chlorine ions. The crown ether pores can trap potassium ions, which possess a positive charge. The trapping and release rates can be manipulated electrically. An electric field of different strengths was applied to trigger the ion current flowing through the membrane. The scientists then simulated tugging on the membrane with different degrees of force to stretch and dilate the pores, significantly increasing the flow of potassium ions via the membrane. Stretching in all directions had the greatest effect, but even tugging in merely one direction had a partial effect. The scientists found that the surprisingly large increase in ion flow was because of a subtle interplay of several factors, including interactions between ions and the surrounding liquid; the thinness of graphene; and the ion-pore interactions, which deteriorate when pores are slightly stretched. There is a very delicate balance between ions and their surroundings, Smolyanitsky said. The study received funding from the Materials Genome Initiative.